It’s officially my favorite season of the year when it comes to traditions! From decorating to gift-giving, the holidays are definitely a time of year near and dear to my heart. I love getting the opportunity to spend time with family, friends and loves ones. And who doesn’t love a great holiday party? I couldn’t be more excited! I have to admit that although the events are amazing, finding something to wear to each one can sometimes be a very serious task. Aside from the events - also comes gift shopping. Each year, my family members from my aunt to my grandmother, assign me the most difficult task of purchasing gifts for the entire family. It always seems to be stressful at first but I have to admit that it’s also a lot of fun. 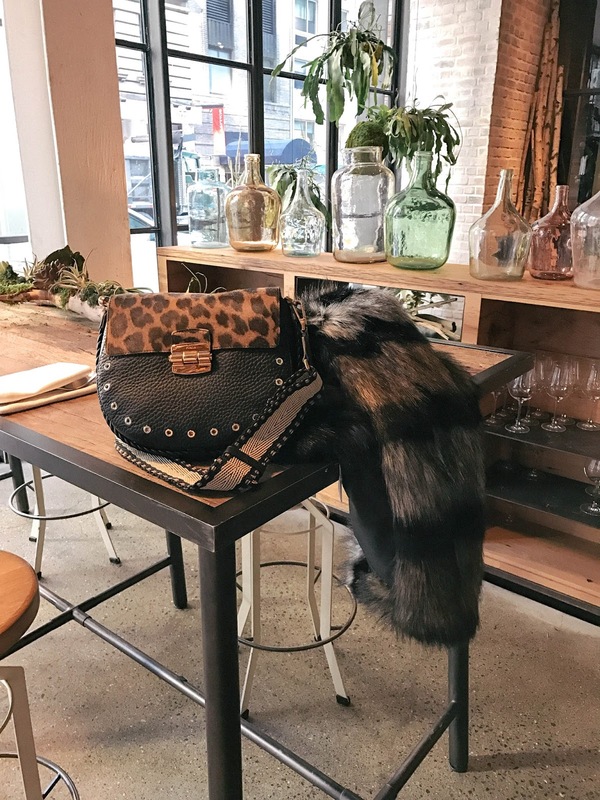 This year, I am not only noticing an ongoing trend with my holiday picks for myself but the same for when I am gift shopping. Having a background in fashion design and having designed clothes for 9 years, knitwear was my specialty. Not only were the holidays our busiest time but my favorite was to design, create, and style the iconic gift giving and holiday party pieces. 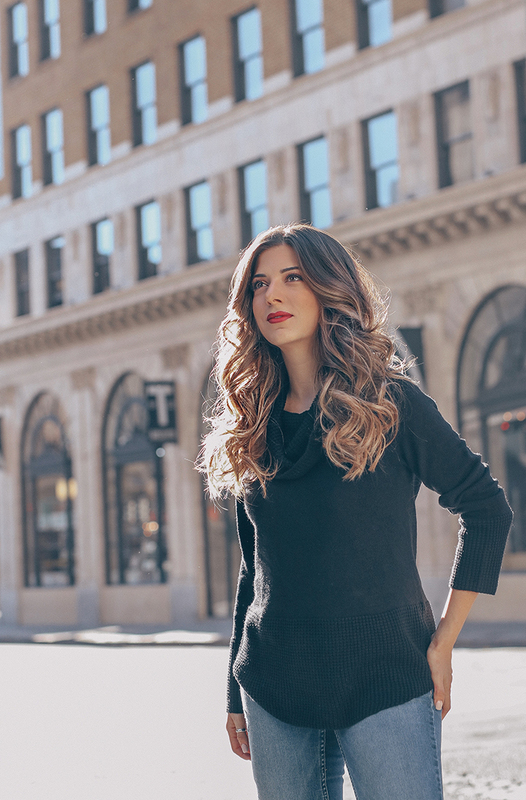 Having a classic knitwear piece that you can style various ways for the holiday season is a key staple for the holidays. I always look for great quality and a neutral color to style with bold accessories. This cowl neck sweater has the perfect length to either be worn as a tunic or tucked into your jeans or a skirt for a more elevated look. It has different stitch details to the bottom hem and sleeves adding character to the silhouette. I not only own this piece for myself but will definitely be gifting it my family members in their favorite colors. I paired my look with iconic red boots - the “It” color of the season along with a red lip. I wanted to keep the look classic and timeless yet a bit edgy. Who said the holidays were only meant for ugly Christmas sweaters? Invest in a great knitwear piece and give another as a gift this season and I promise you that they will not only love the garment but adore you! Now, off to plan my next holiday event or better yet, who I will be gifting this piece in red too? 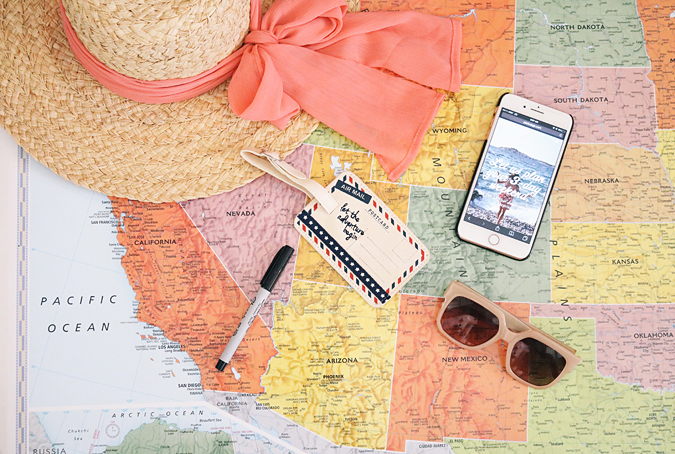 I have always been the one to plan trips for my family and friends. I’m in charge of the itinerary and there is never a question of where to go, what to pack or what to do once we get to our destination. But this time around, I did something totally new. This past weekend, I opened myself up to new experiences by partnering with Marshalls to depart on a surprise trip to Denver, Colorado. However, we had no idea where the destination was until we arrived at the airport, which made it even more exciting! I’ve been a Marshalls shopper ever since I was a little girl when- my mom would take me about twice a week. What I loved most about their stores then is still what I love most now – there are surprises in every section of every store. I might not always know what I am going to find, but I know I’ll always find amazing things that I love. With this in mind, and in the spirit of Choosing Surprise, I went shopping at Marshalls armed with only a weather report and suggested packing list for my unknown destination, packed up my suitcase, went to the airport, and let surprise take over. From the moment I said yes to this surprise trip, I felt more open about embracing the new experiences that were ahead of me. Thanks to Marshalls, I learned how valuable and eye opening it can be to break away from your daily routine (and your typical style!) and have some fun! 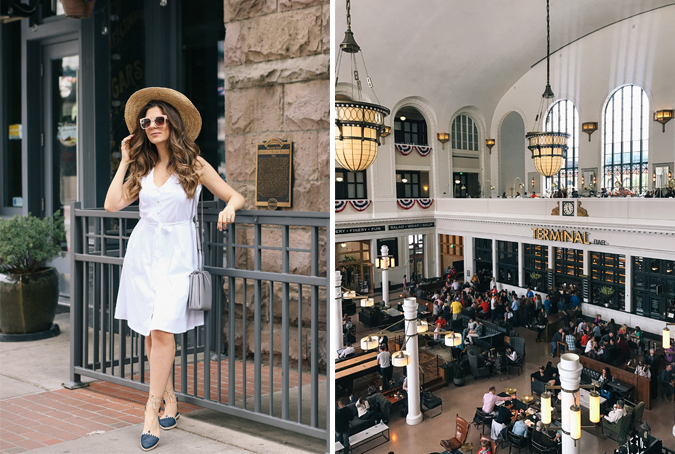 An amazing weekend of new experiences in Denver lay ahead of me, and thanks to Marshalls, I learned how valuable and eye opening it can be to break away from your daily routine (and your typical style!). 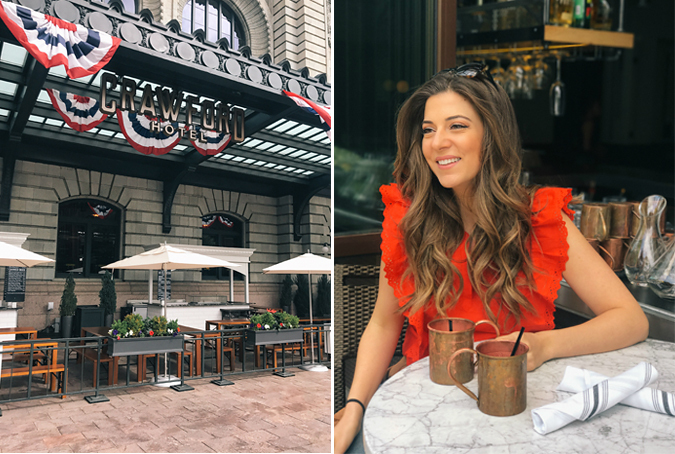 From Red Rocks to white water rafting, a food tour and exploring Denver in between, my trip was certainly filled with excitement and out of the ordinary activities! While I live for the experiences travel brings, I always like to prepare in advance and curate looks depending on the destination. For this adventure, Marshalls encouraged me to shop for unexpected items and outfits (with just a weather report to go off of) to get me ready for an adventure of a lifetime, which was definitely out of my comfort zone! Shopping for these new clothes before the destination reveal was just the push I needed to be more open for this fun- filled adventure. As I was shopping for my outfits, I visited multiple Marshalls locations because the element of surprise in each store made the experience even more exciting. I discovered different athleticwear, accessories and fashionable pieces at each location. One of the best parts? 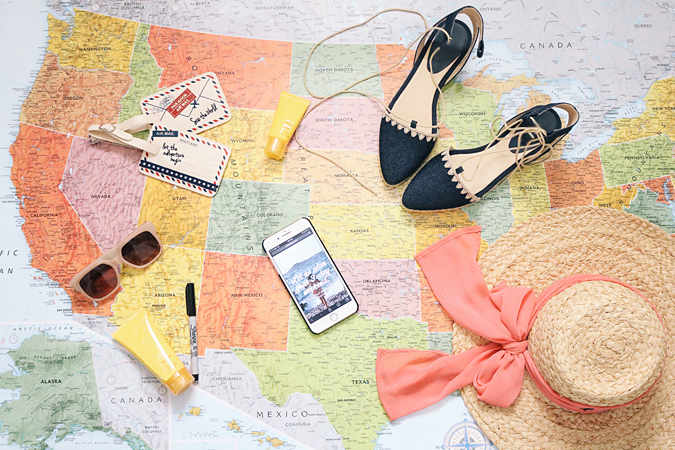 Marshalls teamed up with Pack Up +& Go, a travel agency that specializes in surprise travel. Together, they had a full itinerary and travel accommodations prepared for the entire weekend, which kept me on the edge of my seat the whole time. Two days before our trip, I received an envelope with our destination sealed away inside. It was not only one of the hardest tasks to keep myself from opening it but the thrill of the “unknown” made this surprise trip even more exciting. Upon arriving to the airport, I discovered that we would be spending the weekend in Colorado and I, immediately, shrieked from excitement. As I continued to open the envelope, there was an itinerary for the entire trip filled with planned activities as well as various recommendations. Upon boarding the plane, I not only felt eternal gratitude but knew that this trip was going to be a life changing experience that I would remember forever. 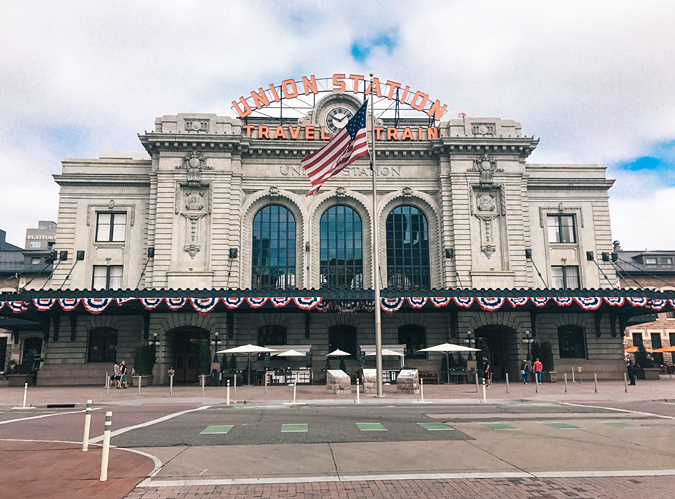 As we arrived in Denver, we stayed at the Crawford Hotel in Union Station. If you have a chance to visit Denver, I highly recommend either staying or stopping by to visit this hotel. From its history, to the amazing accommodations, and beautiful aesthetic, it’s definitely one of my favorite hotels I‘ve visited thus far. 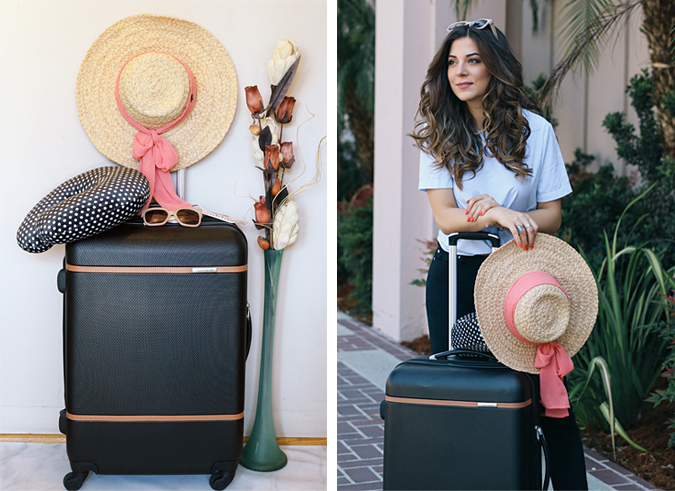 I must admit, packing for a surprise trip was undeniably one of the best and exciting experiences and shopping at Marshalls allowed me to bring my vision to life. I not only shopped for fashionable tops and bottoms to style for evening dinners and morning coffee runs but I had ensembles ready to go for all the activities planned. I opted for colorful outfits to explore the city in, along with comfortable shoes for all our sightseeing. Espadrilles are definitely a favorite and I had discovered a chic, neutral pair that I knew would complete my looks and be comfy while still being fashionable. 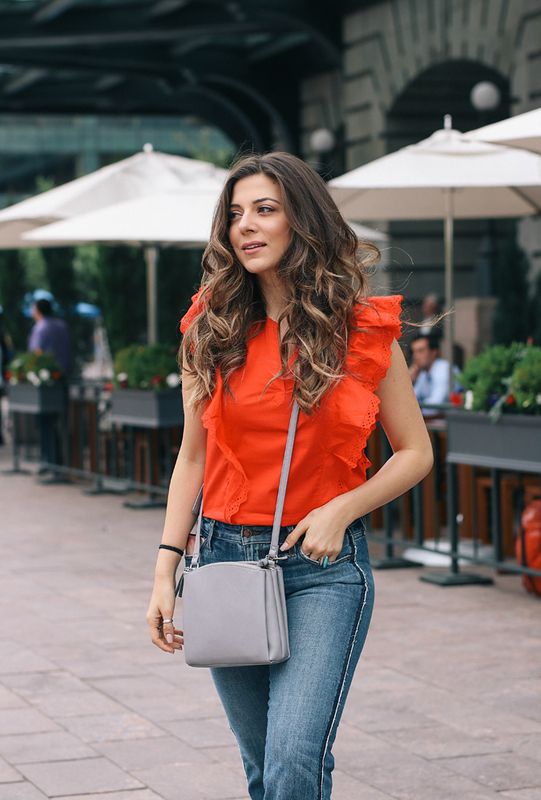 I wanted to keep the looks trendy, so I paired this gorgeous pop of red ruffled top with classic black sunglasses to keep the look chic and polished. 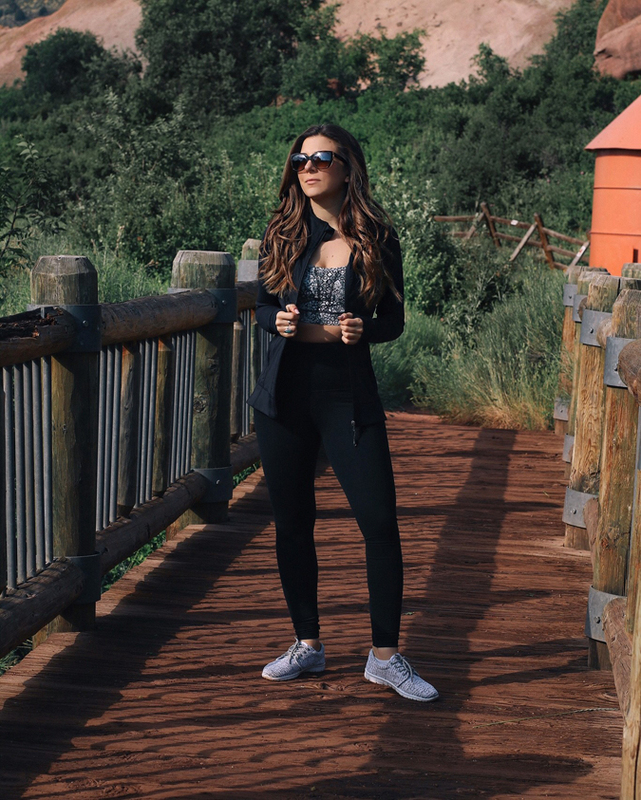 I knew this surprise destination was going to push my fashion boundaries so I also brought along various active wear that would keep me comfortable yet appropriate for the hiking trail that was on our list for the trip. 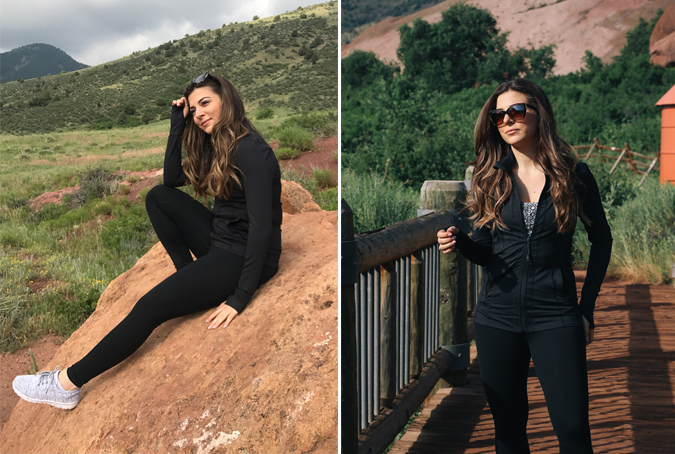 As we embarked on our hiking journey through the Red Rocks, I opted for black and white marled sneakers along with a matching sports bra. 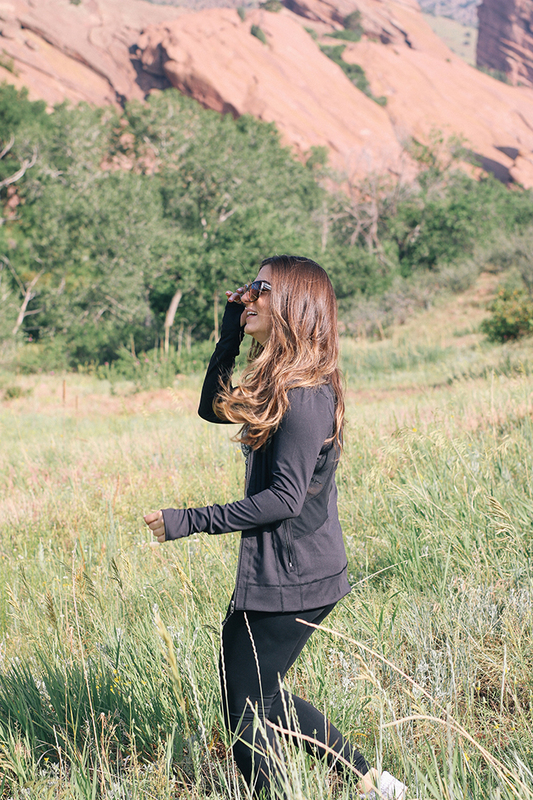 Since it was a sunrise hike, I kept myself warm with a long sleeve active jacket as well as black leggings with fashionable sheer cut outs. The ultimate city girl had found herself amongst nature watching deer pass by and valuing the life lesson that everything comes full circle. As we spent the entire morning in the wilderness, I reflected on how Marshalls had really encouraged me to shake things up and break me out of my everyday routine. The element of choosing surprise resonated with me and not only applied to shopping at Marshalls but also carried over into this trip, I never could have predicted that choosing to infuse surprise into my life would lead me here but I’m so happy it did! I know that we can all get comfortable in our predictable routines and find it hard to open ourselves up to new adventures. Some of us are comfortable with our style and afraid to experiment with new trends and styling details. Choosing to surprise yourself can lead to great things, and that’s why I’m thankful to Marshalls for partnering with me and allowing me to encourage all of you to do the same. 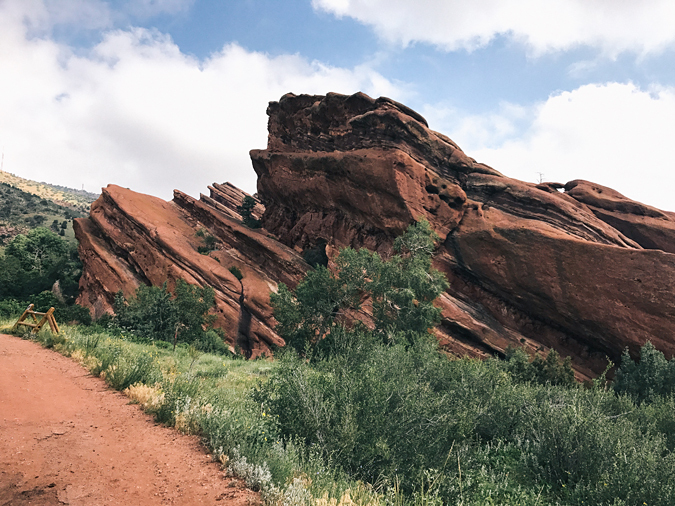 As we hiked through Red Rocks and white water rafted through Clear Creek, I was so happy I packed the right ensembles for each activity and had so much fun. For our last day, I kept my outfit causal chic for our Food Tour of Denver. I opted for a white shirt dress with lace up flats and bold sunglasses. From eating ribs, to different kinds of cheeses and desserts, we learned more about Denver and its history. I couldn’t be more blessed and grateful for this amazing trip and for Marshalls encouraging me to step out of my daily routine this past weekend. Life is all about the unexpected and having fun! This surprise trip to Denver, Colorado really showed me how fun and valuable it is to shake things up and that’s what style is all about! Life is full of surprises and sometimes it’s an unpredictable moment that makes life more exciting! We all have our predictable routines, a recognizable style aesthetic and certain habits that define who we are. But we all have the power to step out of our comfort zones and try something new! Over the years, I have always been the one to plan our family trips and all of my adventures with friends and loved ones. 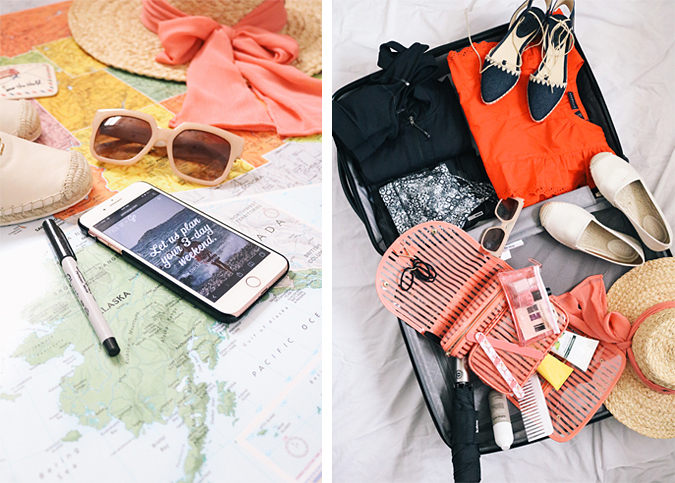 With an itinerary in mind, it’s on a rare occasion that I have not known what to pack, where to go, and how to dress for the location. But for my next adventure I’m partnering with Marshalls to choose surprise and try something totally new. They are sending me on a surprise trip this weekend via Pack Up + Go to a mystery location. That’s right! I’ll have no idea where I am headed until I actually get to the airport. How’s that for breaking up a predictable routine?! I couldn’t be more excited to find out where I’m going, but also the beauty of this partnership is that it’s reminded me that sometimes life brings you full circle to a place you have been before to show you how much you’ve grown. Growing up, my mom and I would step into a Marshalls twice a week and we never knew what gems we were going to find – but we always found things we absolutely loved. We would experience surprise each time we walked into the store and I’m excited to now open myself up to some new experiences with a retailer I grew up with. I was given just enough information to know how to pack. When selecting merchandise, I was also encouraged to break away from my typical denim and white button up aesthetic and choose surprise. Since I won’t know exactly where I am going until the day of, I had to prepare for a surprise vacation and pack merchandise I never expected. The beauty of walking into Marshalls is that is has high quality products and designer merchandise. You never know what great things you are going to find – but you know you’re going to love it! The theme for what I had to shop for was fitness, exercise, and active activities. 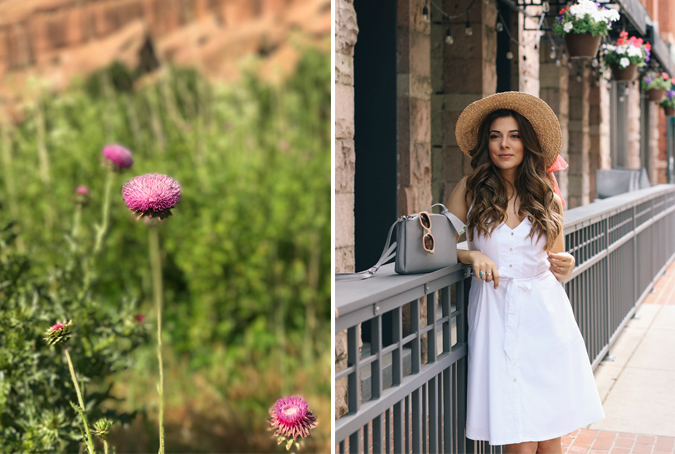 It was an exciting challenge for me to look for new styles that are typically out of my regular routine and this opportunity reminded me how much fun it can be and what amazing things can happen when you surprise yourself in life, travel and shopping! To prep for my surprise trip, I headed to my local Marshalls store. Marshalls provided me with a weather report for my destination and a packing list to give me just enough guidance so that I’ll be sure to have everything I need. Shopping for a trip when you don’t know where you’re headed added another layer to my excitement! And I found some amazing stuff that I can’t wait to wear and use during my travels. 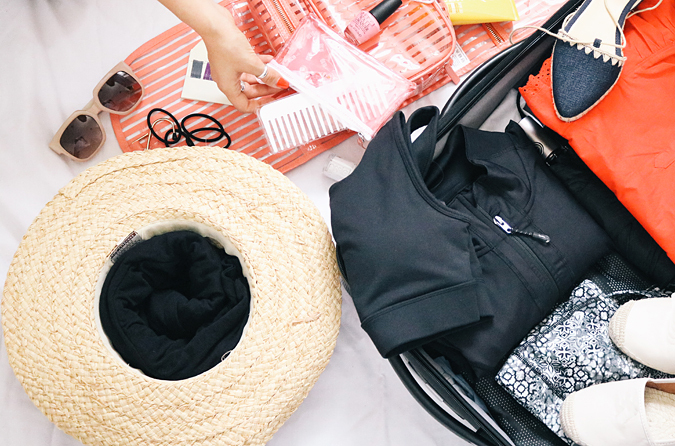 Since packing for a weekend of surprise can be a bit of a challenge, I’ve put together a list of my top packing tips. When I write it out, I always make sure I have everything I need and I am able to cover my bases. I tend to forget the little things, such as sleeping masks, and end up having to buy a new pair every time I travel. 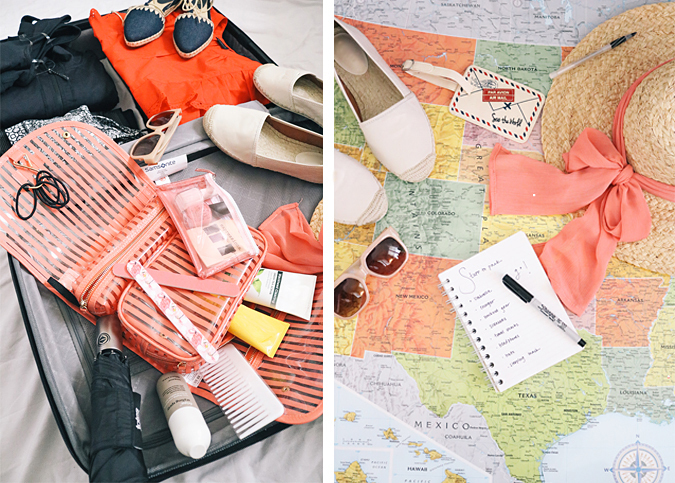 Write a list out ahead of time and cross it off as you pack them away in your luggage. 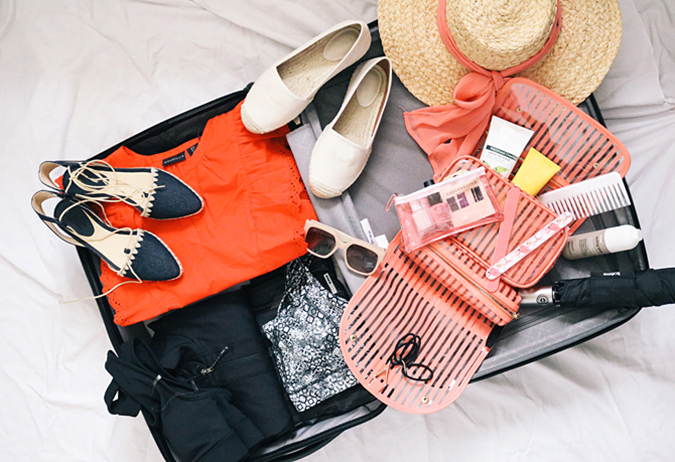 For me, remembering to pack shoes and outfits is the easy part. It’s always the little details like beauty products, tech items and accessories that make me more anxious when packing. I love using transparent clutches for my sunglasses, nail polish, sun care and so much more. Different pouches keep everything separated and I can see exactly what I need since they are transparent. If I am bringing a hat, I will always stuff a knit top or roll a clothing item up in the body to keep the shape. If you are packing denim, you can also roll it up to save space in your luggage. Since I don’t know where I am headed, I am sticking to a cohesive color scheme. 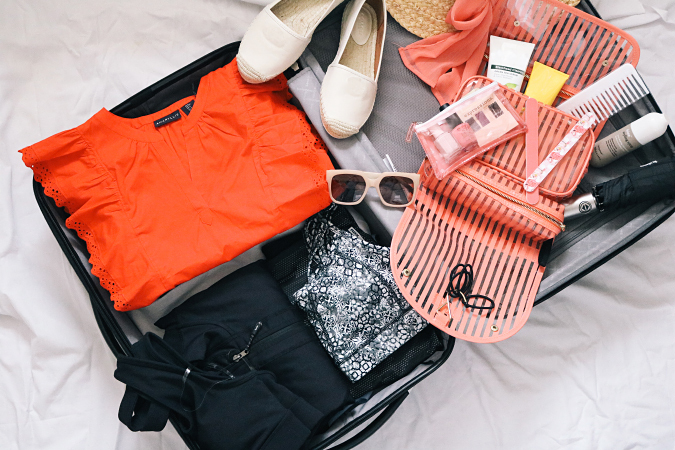 With an itinerary that is going to be a surprise, I want to have the flexibility to mix and match my outfits and also have comfortable shoes that match back. Limit yourself to only 2-3 pairs of shoes. I always keep my tech items in a carry on tote or bag. You never know when you are going to need your memory card, laptop charger and it’s always more convenient if you have more time than anticipated. And now we’re off! Stay tuned and make sure to follow along to see where I am headed. I will be sure to cover it here when I am back! This post is sponsored by Marshalls. All opinions are my own. Thank you for supporting the brands that support this blog! Hi Everyone! Today, I am sharing my favorite new products of the month in a series called #SSFavorites! Every month brings new obsessions and products and each month, I will have a blog post highlighting my top 10 favorites. It will range anywhere from beauty, hair to accessories and fashion. This new series will feature new products, my current go-to's and all time favorites. Click the links below to discover what made onto the May Favorites list! I am currently in the process of re-working my entire blog. We are going to re-brand and re-launch! So excited to share what I am working on! In the meantime, is there any content on the blog that you want to see more of? Any questions that you want to be answered? I would love to hear your requests and feedback. Let me know in the comments below what some of your May favorites are? I would love to check them all out! Have a great week everyone! Is there anything more classic for the transitional season than your classic denim jacket? Spring is in full season and I couldn’t be more excited. As eager as we all are to shed our third layer pieces off, you definitely want to consider keeping a light jacket around for those colder evenings. While some may assume denim jackets are meant for the summer, I actually consider it a classic staple piee year around. However, there is something chic and ultra cool when you bring it back out for Spring and Summer. 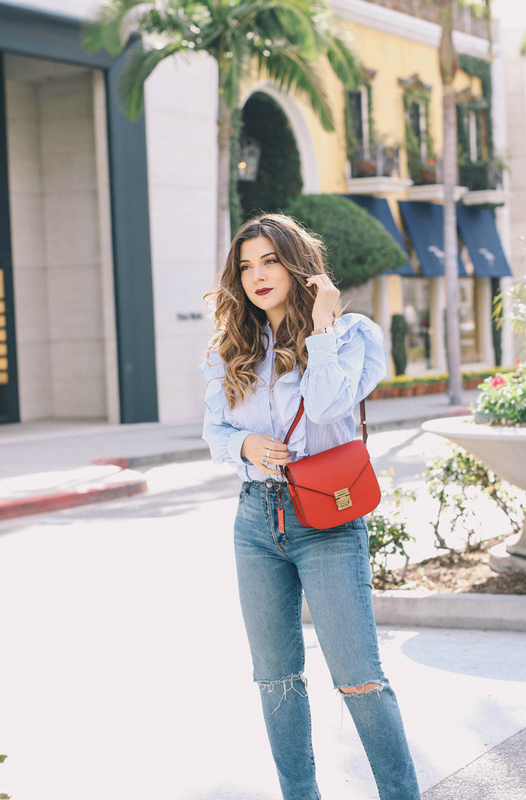 It’s the ultimate transitional outwear: tie it around your waist if it gets too hot during the day or throw it over your shoulders at night for a statement look. Now how do you wear the oversized denim jacket trend? Try pairing it with a summer dress in bright colors, prints, or optic whites to keep the look light and airy. I like to either pair it with dark washed or black jeans for a variation in color but it looks even better when paired with jeans to match. When it comes to the denim jacket, your styling options are endless and just have fun with it. I have rounded up some of my favorite denim jackets ranging from ultra distressed to polished with embroidery. Jean jackets were always my go-to since I was little. I remember going to Disneyland when I was 6 years old wearing one with Warner Bros characters on it. It’s always been a staple but this season, it underwent major treatment. In line with the “borrowed from the boys look’, the denim jackets are coming in multiple different versions. Whether it’s oversized and distressed or ultra feminine with embellishments and lace, these denim jackets are making a big statement this season and I am loving it right now. Winter in New York City is quite the experience and although many want to escape the cold, it’s a refreshing change in weather for us Southern California based individuals. It was an eventful and busy four days! Although there was a crisp hint of cold air and less than 40 degrees the first day, the weather warmed up in the lower 60’s towards the end of our trip. While Los Angeles was experiencing a terrible rain storm, it was nice to escape to my favorite city in the U.S after all! My mom had not been to New York in 6 years and I wanted our mother daughter business trip to be productive yet tons of fun. While I was running from meeting to meeting, I wanted the location of our hotel to be an easy neighborhood for her to explore and enjoy some time in the city until I met back up with her in the afternoons. The 1 Hotel Central Park is a fantastic property situated walking distance from Central Park yet in the middle of Manhattan. 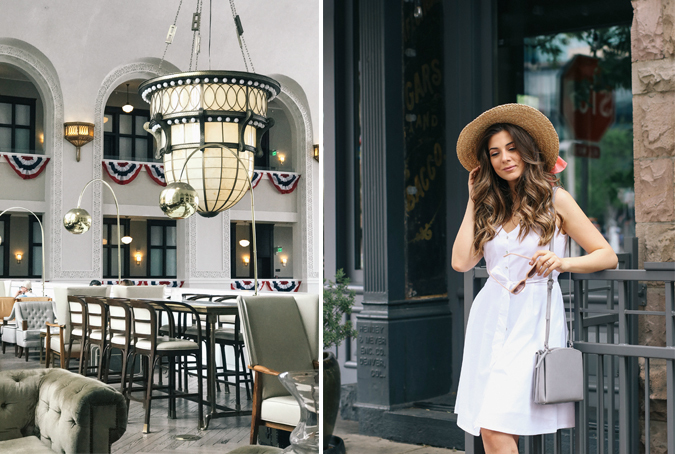 I had previously stayed at the 1 Hotel location in South Beach, Miami, so when I discovered their New York location, I jumped at the opportunity to make it my home for the week. It’s a gorgeous property surrounded by thoughtful details of natural materials and many living green plants. 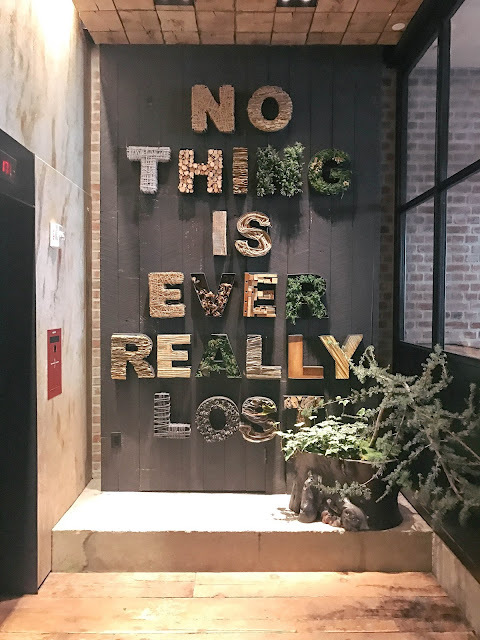 In fact, when you first walk into 1 Hotel Central Park, you will see a lobby that perfectly captures their mission of how in nature, everything is interconnected. 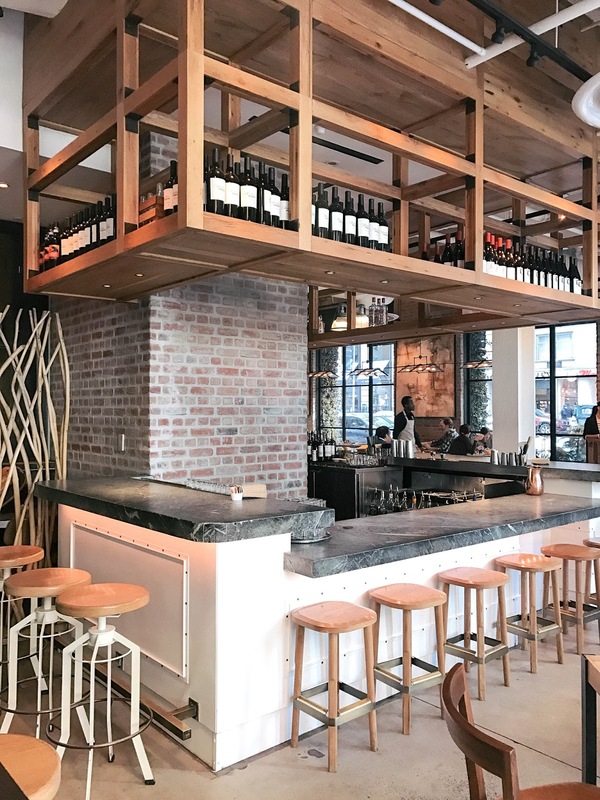 Surrounded by reclaimed and natural materials, my favorite part was the accents of brick, copper and many touches of nature. As you passed the lobby, you could find a Farmstand by the elevator that had fresh fruit, nuts and granola open to their guests and neighbors. I love how the 1 Hotel team has captured such beautiful experience and that hospitality is shown through their amazing staff. Once we were all checked in, we were greeted by a room that exceeded our needs and expectations. Not only did we have a spectacular view extending over the city streets, I, immediately fell in love with the marble shower, HD sound system, and how at the touch of a button, the concierge or any other need was met within seconds. It was very spacious and our bed had been made with all very comfortable natural elements and organic cotton sheets. We loved starting our mornings at Jams with a delicious buffet style breakfast and an invigorating cup of coffee as we prepared our agenda for the day. 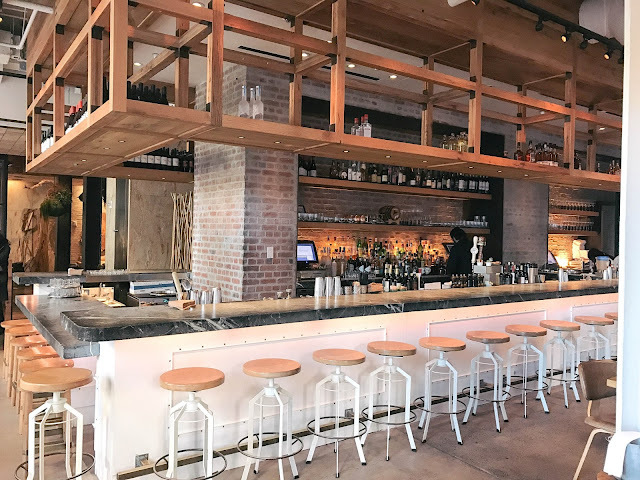 Not only was Chef Jonathan Waxman at Jams named “Best Chef in New York City”, the atmosphere and look of the restaurant is just as phenomenal as the food. Just in case you didn’t have enough over brunch, you can refuel on your own schedule with in-room dining that is 24 hours a day. Aside from a comfortable and cozy space that felt like home, the location was amazing and we definitely took advantage of our surroundings. We spent our afternoons walking to Central Park, and made our way to Fifth Avenue afterwards for some shopping. It’s also very close to Columbus Circle and the Theater District. Having the privilege of traveling often, I always like to look back and reflect on my favorite part of the trip. Not only was the hotel and its ameninities spectacular but the people at the 1 Hotel Central Park were my favorite part. From the moment I checked in to the moment I left in my Uber with my bags, each staff member was incredibly friendly and made me feel like at home. All in all, this was one of my absolute favorite experiences of the city. I can’t speak highly enough of all of the people at the 1 Hotel Central Park and how kind and helpful they were during our stay. I can’t wait to return and I want to thank everyone at the hotel for making our stay such a fantastic experience. I love discovering new hotels and could not be any more pleased with the 1 Hotel Central Park. 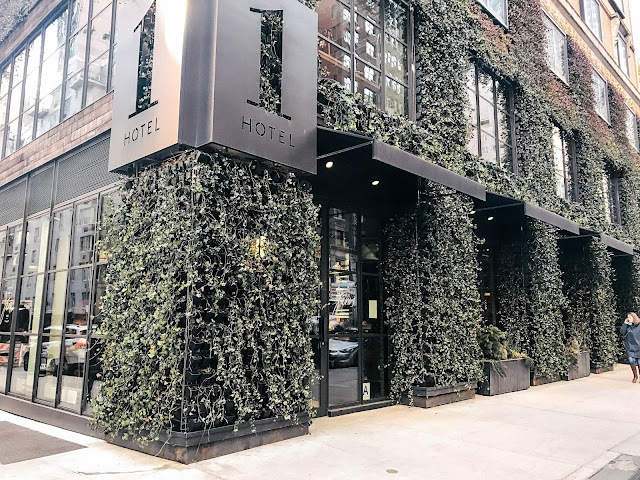 Make sure next time you are visiting, to book your stay at the 1 Hotel Central Park or their new location in Brooklyn. As the weather starts to get warmer, we all want to remove our outerwear and place our coats in the closet until next winter. One of my favorite parts about Spring is the excitement for new fabrications, pops of color, and silhouettes. This season, our classic shirt has evolved with multiple details and I am so excited. The first trend that is going to be very strong is the ultrafeminine ruffle detail. As I was browsing the stores, runways, and online, the ruffle detail can be found anywhere from pants to tops. 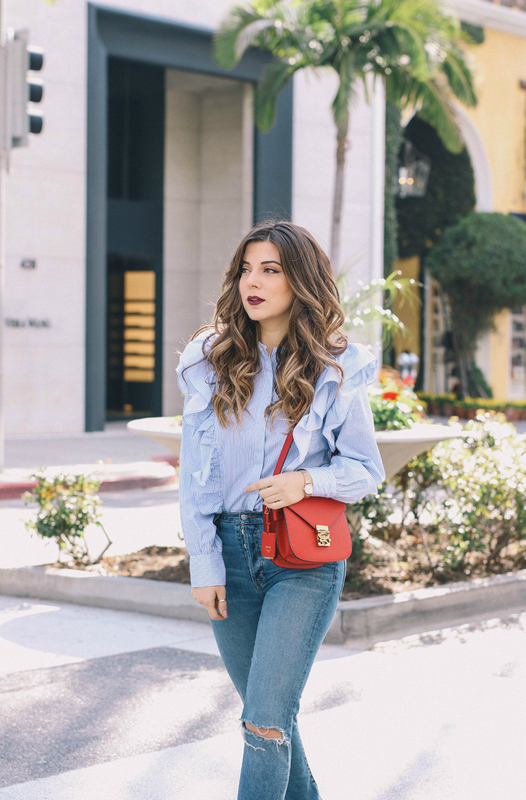 I have always been a girl who loves to pair her classic denim pieces back to either edgy pieces or in this case, with a feminine top. 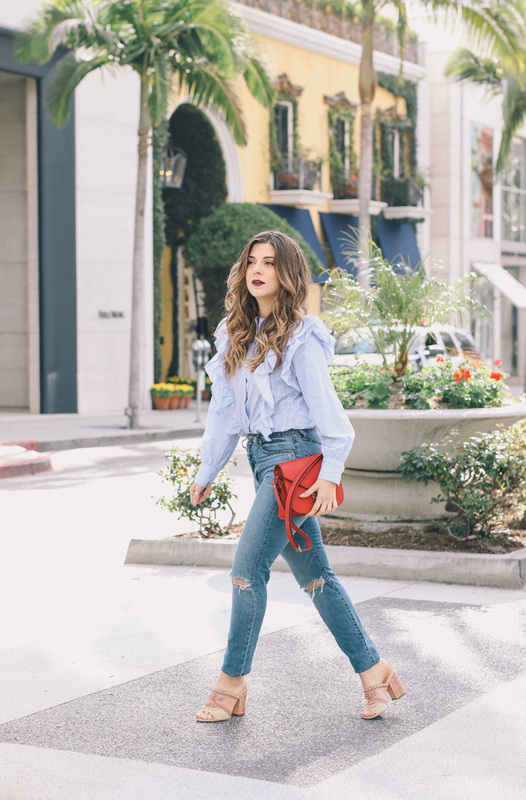 The ruffle trend can be a bit overwhelming for some or difficult to style for others. Don't be afraid to experiment. I always gravitate towards more delicate trims but decided to opt in for the oversized ruffle shirt. Since this silhouette was oversized, I paired it with a high waisted bottom to accentuate my waistline as well as keep it more fitted. What are some of your favorite Spring trends? Whether you are a morning person or not, waking up is usually a struggle that mostly consists of an extra shot of espresso, tons of coffee, and your snooze button. We all have a daily routine that gets us out of the house but does it necessarily motivate you to conquer the day? If you're anything like me, your morning routine can affect how you feel for the rest of the day and it sets the mood for everything you plan to accomplish. I consider Mondays motivational because not only is it the beginning of a new week but having the right mind set can get you excited for what's to come. I definitely can relate when we all say "the struggle is real" so I wanted to share my top tips on how to make your mornings as exciting as possible. My mom would always joke that I woke up on the wrong side of the bed when I was not joyful in the mornings. As I share my tips, I can't help but to laugh and share my top tips on how to make us all feel happy, relaxed so we can wake up on the right side of the bed every morning. The most infamous morning routine - I am guilty of it and almost all of us are. Try your best to stay away from the snooze button! Believe it or not, pressing snooze will only leave you feeling groggier and more tired. Give yourself enough time to get up when your first alarm sounds. What did you eat as you left your house this morning? If we are being completely honest, I ate a granola bar as I rushed out of the house and packed my breakfast to go. This is what we should all avoid. Give yourself enough time in the morning to make sure to eat a nice breakfast without rushing. Indulging in a healthy breakfast can instantly make you more energetic and awake. As you wake up, kick start your morning with a large glass of water. You can prepare yourself by leaving a bottle by your nightstand as an easy reminder. Drinking a glass of water as soon as you get up help replenish the fluid in your body that it loses overnight; leaving you energized and refreshed. A great way to release endorphins and feel less stressed is by getting blood flowing throughout the body by stretching in the mornings. A good stretch will start your day off feeling productive and positive. Wake Up Half An Hour Earlier. Waking up 30 min earlier than your usual routine can make the biggest difference to your day. This will allow you to not only eat a healthy breakfast but plenty of time to get ready and enjoy your morning. You will wake up happier and less stressed. Give it a try and you will see that you will soon be doing a little something you enjoy before your day starts. Take 10 minutes of your time before you sleep to prepare as much as possible for the morning of. Whether it's your car keys and wallet, you don't want to rush out of the house forgetting anything and feeling more flustered. Having your purse ready in the morning will eliminate the stress of looking for your work notes and give you time to enjoy your breakfast at ease. I hope you enjoy these tips! I have some exciting news I can't wait to share with you all. I am re-working a few things as well as launching a thing or two so please bear with me as I try to transition from one platform to another.